Today’s economic development has been redefined. The convergence of people, place, and politics has created the need for a new approach to economic development. An approach that works to include more stakeholders, develop a community’s culture, and respond to a more socially aware landscape. People are the heartbeat of every community. They are the lifeblood that fuels growth and sustains culture. Unfortunately, the shortage of talent continues to be a barrier to growth in many communities as people are being drawn to places that are as unique and discrete as its residents. Each of the 3,100 plus counties in the United States has a different story that is homegrown and shaped by its people, and each is competing to share its story. All of this is taking place within an ever-changing and constant political environment, with social media enhancing the reach of stories and influencing the decisions of audiences to a far greater degree. This impacts economic development because people now have access to greater amounts of information than ever before, which influences their choices on where to live, work, spend their money, etc. This increases the competitive landscape for communities to compete for greater growth. As a result, economic development must adapt to meet a more responsive and aware audience. One need only look to how this has shaped and impacted companies across the world. General Electric’s decision to move its headquarters highlights the importance of place. HP’s recent campaign on how it is focusing its recruitment efforts on skills and investing in additional training for hiring managers to reaffirm this effort showcases the importance of people. Finally, Facebook, a company with over 1.3 billion users globally, launched a national ad campaign, “Here Together,” reaffirming its commitment to users and simplifying its message back to its own roots. Facebook is not alone in this trend of “apology ads.” Uber and Wells Fargo have each launched their own brand resets, following their own controversial scandals. Companies are becoming more responsive to social trends and political influences that are shaped by them. Without a doubt, the landscape has changed and will continue to do so. By 2020, 50 percent of the global workforce will have been born in the last three decades, and this number is expected to climb to 75 percent by 2025. Companies have begun to shift the way they recruit, the values they stand for, and the culture they build. Economic development is not isolated from these changes and practitioners will need to change their strategic approach. The planning process must elevate authenticity and transparency as key values with greater focus on building community culture that is intentional and inclusive. This will lead to a platform that allows for greater input from a broader array of stakeholders. More than ever, strategic partnerships, built regionally, will be elemental to creating a network to support and implement a holistic approach to economic development. Most importantly, the strategies must start at the convergence of people, place, and politics. 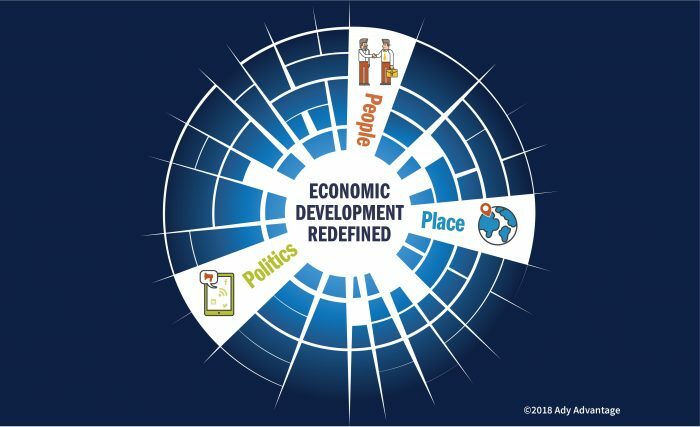 Economic Development 360 ™ drives change in communities that is beyond the conventional. How can your community think globally, act locally, and be informed socially? Let’s start the conversation today! Give us a call at 608.663.9218.